All of us have struggled to get out of bed in the morning. When that dreaded alarm shatters your blissful slumber, the temptation to hit the snooze button repeatedly can be overwhelming. Having trouble getting out of bed can be a problem at any time of year, but dark winter mornings are undoubtedly the worst. Rising before the sun is not only unpleasant, but simply unnatural, so it is no wonder we feel awful when it goes off. One solution to make mornings calmer is to use the best wake-up light. Since these mimic the sunrise, others also call it a sunrise alarm clock. It gently wakes you with light, rather than a harsh alarm, leaving you feeling refreshed and ready to face the day. In this review, we examine the top 5 in the UK, so you can decide which one is the best sunrise alarm clock to help you rise and shine! What Are The Benefits of Using a Sunrise Alarm Clock? The Philips HF3520/01 is one of the most popular models in the Philips range. Offering 20 different brightness settings, 5 sounds, a digital FM radio and an incredibly bright 300 Lux LED light, has something for everyone. The shape of this clock almost resembles that of a cone speaker. It has a large, flat face, which gently curves at the edges – tapering to a narrower, wedge-like shape at the back. The exterior of the light is a clean and contemporary white colour which will suit any room. Its time display is a gentle, non-intrusive deep-yellow hue. The brightness of the time display can be adjusted to one of 4 levels to suit the users liking, and will also automatically adjust to the ambient light level in the room. Philips HF3520/01 also features a number of easy-to-reach buttons located around the rim of the light face. Some of these buttons are positioned in small groups depending on their function. Simply set the time you wish to wake and this will slowly brighten over the 30 minutes prior to your chosen wake time. The light starts at a low orange glow, gradually building to a bright yellow light which simulates a natural sunrise. If you find the maximum brightness too harsh, you can simply adjust it to one of 20 other intensities to suit your preferences. For those users who are particularly heavy sleepers, at the set wake time, a sound will play to make sure you are completely awoken. There are five different nature sounds to choose from, but if birds chirping isn’t your thing, you can set the FM radio to come on instead. The chosen sound will start at a low volume and gradually increase, so as not to startle the user like a traditional alarm. However, some sunrise alarm clock reviews reported that the FM radio experienced interference when the light is illuminated. This offers a snooze mode which will stop for 9 minutes before it begins to gently play again. One downside with this feature is that some people found it was easy to mistakenly turn it off altogether. A further benefit of this is the inclusion of a dedicated ‘sunset mode’. Just like the waking function but in reverse, the sunset mode gradually decreases the lighting and sound level to darkness and silence, thus stimulating the user to fall into a naturally restful sleep. Overall, this product is very effective and easy to use, but some people said the instructions weren’t the easiest to understand at first. 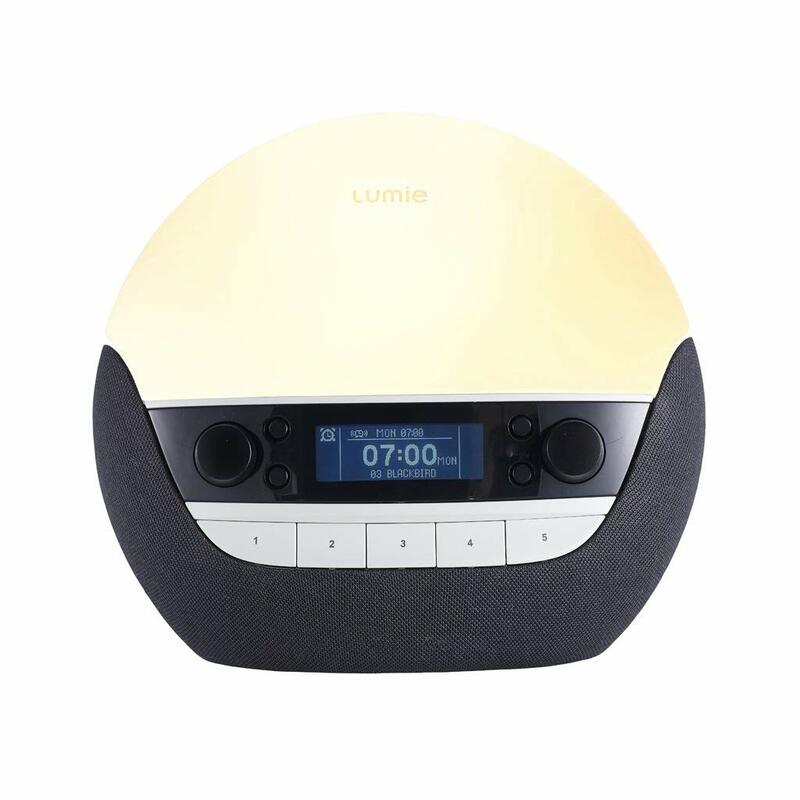 The Lumie 30 Bodyclock Starter Alarm Clock is a great choice for those gloomy winter mornings. Having both a sunrise and sunset function, as well as a backup alarm; this should leave you feeling refreshed and ready to face the day. The sleek curved lamp design resembles a half-circle, almost mimicking a sun in its shape. It has a solid white base, an indented control panel and clock face just below centre. Its buttons do feel a little cheap to the touch, but this lamp is one of the lower priced options on the market. This is relatively compact and looks subtle in the room. The brightness of the clock display can be reduced or even completely turned off. This is a great feature for people who are light sleepers and may be disturbed by the glow during the night. To use this, all you need to do is set the time you wish to wake, and it will do the rest. The lamp will start lighting up 30 minutes before your wake time, slowly increasing in brightness until it reaches its peak at your preferred time. There is a backup alarm option just in case the light alone doesn’t wake you, but there is only one sound to choose from. Some users found this to be quite a harsh beep. The bulb used in this model is a halogen bulb, not an LED one. Therefore when being used as night lights or reading lights, it is important to be aware that the lamp can get rather hot. This also offers a sunset mode to help the user relax after a long day and get ready for sleep. The lamp gradually decreases from full brightness to being completely off over a period of 30 minutes. This product is relatively hassle-free to set up. A 42-watt bulb is included, and the user simply needs to pull the dome away from the base to screw the bulb in. The dome then easily clicks back into place. Some people found that it didn’t keep time very well and that they had to regularly reset it. 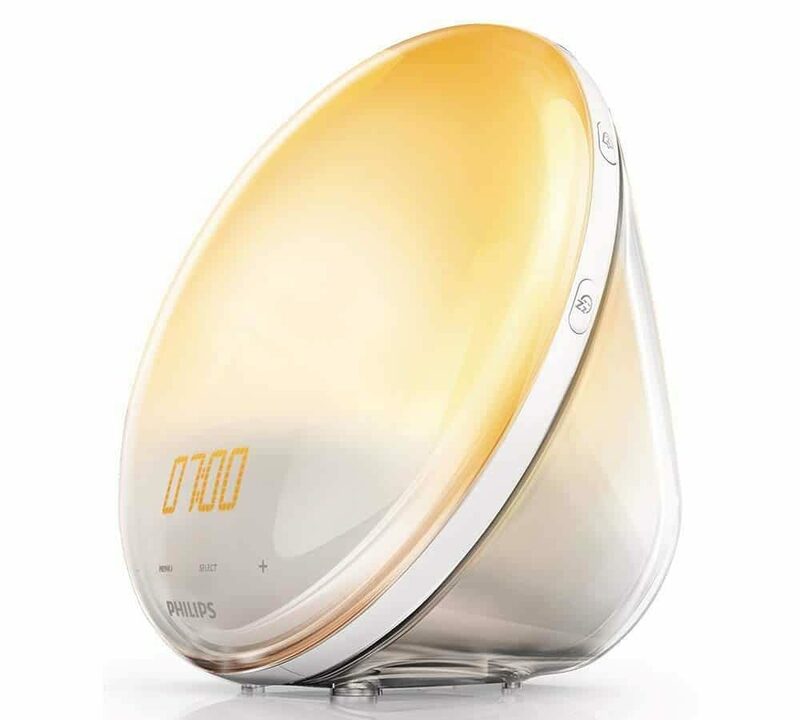 The Philips HF3505/01 Wake-Up Light Alarm Clock is a lower priced option to the previous model we looked at earlier. It has slightly fewer attributes, but it is still a fantastic solution to the winter blues. This lightweight wake-up light offers a very modern and unusual design. The round face is very slim and looks like a disk with a small stand behind it to keep it upright. The clock face and controls are located in the centre, surrounded by a large ring of light. Nine buttons are situated evenly around the time display, but they can be quite awkward to press without pushing the light away from you. However, because of the compact design, this is perfect for those who have little space on their bedside table. Just like other models we have seen, this aims to slowly raise you from your slumber by progressively increasing the light level in the room over 30 minutes. Simply set the time you need to get out of bed, and by this time the light will have reached its maximum level, naturally waking you. Of course, sensitivity to light can vary among individuals, so this allows the user to choose between 10 different light intensities. The highest setting is 200 lux, which should be plenty bright enough to wake most individuals. On the other hand, if you are particularly sensitive to light, the brightness of the digital display clock can be reduced, but cannot be turned off altogether. Once the wake time comes around, the user has a choice of two nature sounds or FM radio. The volume starts low and gently increases to make sure you are fully awake, without startling you. Should you not feel ready to rise from the comfort of your bed yet, you can tap on the body of the light anywhere to activate a 9-minute snooze mode. One downside of this model is the lack of a battery backup function. Unfortunately, this means if you experience a power cut during the night, your alarms will not go off. As well as being a natural light alarm clock, you can use it as a bedside light. However, unlike other models we have seen, it doesn’t offer a sunset mode to help you wind down for sleep. Furthermore, it has an easy setup where once all your settings have been entered, you are unlikely to need to alter them again. On the other hand, instructions are not particularly detailed and some users found them confusing. 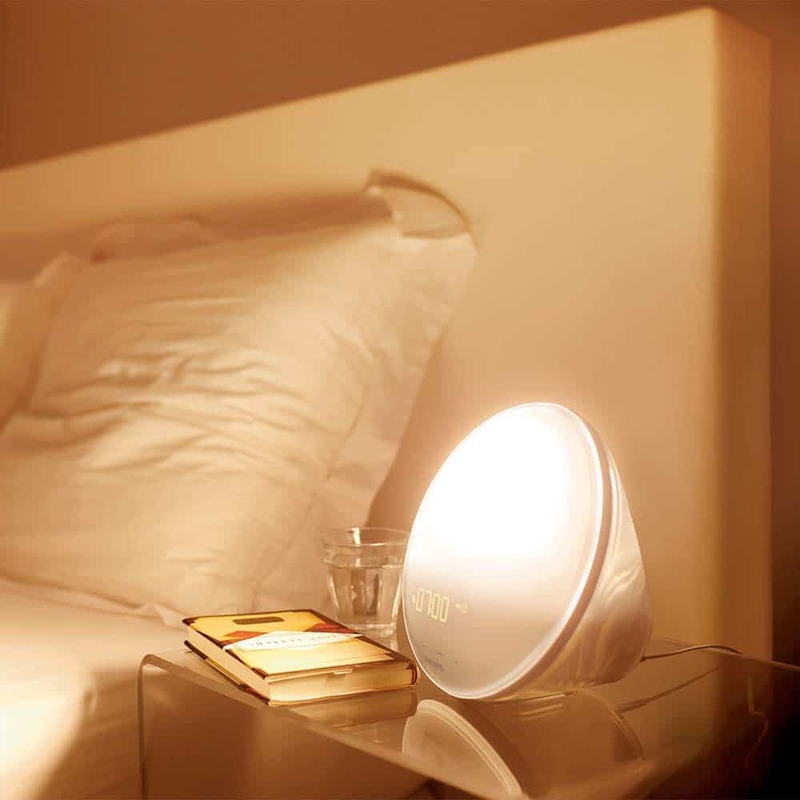 This Alarm Clock Wake-up Light with Sunrise/Sunset Simulation is made by a company called LEVIN. Resembling the appearance of the Philips HF3505/01, this has a large, flat face, with a circular time display and control panel in the centre. Surrounding this is the lamp itself, which looks like a wide ring of light around the edge. In line with similar models, this has an intelligent sunrise function to slowly and gently wake the user with lighting. Offering 11 brightness levels, the lamp will illuminate incrementally from 0% to 100% over the 30-minute period before a given alarm time. You don’t have to rely on just this light to wake you up, though. It also includes 6 sounds to make sure you are awake and ready to get out of bed when required. These sounds are a mixture of nature sounds, instruments and if you’d rather keep things simple, a standard beep. Furthermore, for those who prefer music in the mornings, this sunlight alarm clock features an FM radio as an additional option. Both manual and automatic channel scanning are supported, and up to 40 of your favourite radio channels can be added to your own playlist. The snooze function gives a further five minutes of rest after the alarm has sounded. Although, some heavy sleepers complained that it only sounds for about 2 minutes before automatically snoozing. If you find that you struggle to wind down after a long day, it features a useful sunset simulation to help coax your body into preparing for sleep. However, some light alarm clock reviews said that the sunset mode was accompanied by an irritating humming noise. Furthermore, this can be used as a bedside mood-lighting. Six different colours are available to choose from for optimum relaxation. However, one downside of this product is the brightness of the time display, with many people saying the bright orange glow is too intense during the night. Unlike other models we have seen, it doesn’t appear that the display brightness can be adjusted; but if necessary, it can be switched off altogether. 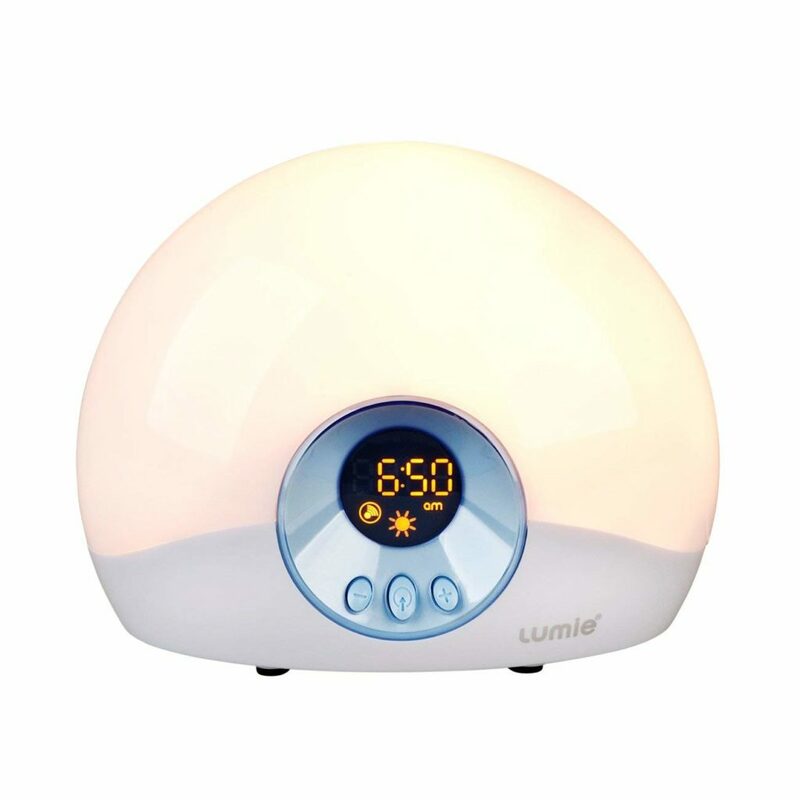 The Lumie Luxe 750D Bodyclock wake-up light has a beautiful, contemporary design which will look the part on any bedside table. Featuring a curved glass top and a black speaker base, the small display screen is located bottom centre, set into a black plastic band underneath the glass dome. A series of small buttons surround the digital display, allowing convenient access to the functions and various settings. Unlike other products in this review, this has a USB port at the back, so the user can charge their devices or play their own music through the speakers. Once you have input your waking time, it will start to gently illuminate to reach full brightness by that time. 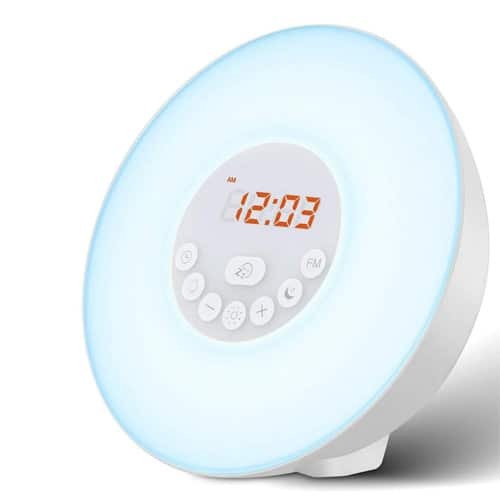 Due to the use of mixed LED lights, the colours replicate that of a real sunrise very closely making this the best SAD alarm clock on the market. Users have the option for the sunrise simulation to begin anywhere between 15 and 90 minutes before the wake time. Furthermore, the intensity of the lighting can also be adjusted to suit the users’ preference. While most people will be awaked solely by the light, this offers over 20 sound effects, as well as DAB radio as an optional alarm. However, some people felt the radio reception could be better. When it’s time for bed, it uses a non-stimulating, low-blue lighting, which simulates a sunset by gradually fading to nothing, helping you to drift off into a restful sleep. The time display is completely dimmable, so as not to disturb users during the night. If a power cut occurs, time is kept for 30 minutes, but there’s no backup battery option. We go to great extents to relax like soaking on a hot tub or having a long shower. That being said, we should make sure we wake up relaxed as well and daylight alarm clocks are great in achieving this. Now that we have seen some of the best sunrise alarm clocks on the market, let’s examine some of the benefits of using them over traditional alarm clocks. Millions of years ago, long before the invention of artificial lighting, the human body evolved to wake with the sunrise, and sleep with the sunset. As diurnal creatures, our eyes have specialised receptors, which stimulate wakefulness hormones upon sensing increasing light levels. In modern times, we often have to rise from our bed long before the sun will come up. Waking up in darkness is an unnatural act for humans, so it is understandably unpleasant and sometimes incredibly difficult. The use of the best wake-up light fools the body into thinking that dawn has broken, meaning you will wake naturally with the light. The harsh beeping of your alarm may wake you up, but it often leaves you feeling groggy and sluggish. This is because your body has been rudely startled awake; instead of gradually and naturally transitioning from a state of deep sleep to full alertness. The lethargic feeling can take an hour or more to completely pass and makes leaving your bed and getting on with your day seem almost tortuous. By using the a sunrise alarm clock, your body will have transitioned out of deep sleep slowly with the increasing light, just as nature intended. Thus, it increases energy levels and makes getting up much easier. Many wake-up light reviews report that the user’s productivity throughout the day also increased once they start using a dawn simulator alarm clock. Seasonal Affective Disorder or ‘SAD’ is a condition which is suffered by one in three people in the UK every year. Women are more susceptible to SAD than men, being up to 40% more likely to be diagnosed. SAD is a form of depression caused by a lack of daylight. It presents during the short days of the winter months, and is often simply referred to as the ‘winter blues’ or ‘winter depression’. Clinical studies have shown that exposure to light has the ability to have a positive effect on physical fitness and psychological well-being. SAD sufferers often use light therapy as an effective treatment to lift their mood. Using a sunrise simulation alarm clock is a great way to ward off SAD during the darker months of the year. Waking up to a bright room, rather than a pitch black one, is enough to make a vast improvement to your health and fitness. Furthermore, they usually offer a special sunset mode to help users naturally wind down in preparation for bed. The use of this mode can improve sleep quality, which in turn is incredibly beneficial to overall health. It will come as no surprise that the maximum brightness is one of the most important considerations to take into account. Essentially, the brighter the light, the more effective it will be at waking you. The light intensity of sunrise simulator alarm clocks is measured in a unit called illuminance or luminous emittance, ‘lux’ for short. In general, sunrise alarm clocks will be somewhere between 100 and 300 lux at their maximum. The lux rating tends to increase with the price, so it is best to go for the lux rating you can afford to buy at a brightness that suits you. The light source is more a case of personal preference. The vast majority of daylight alarm clocks use LED lights. These are energy efficient and are available in many colours. They also have a very long life, which is beneficial because they are usually very hard to replace. However, some sunrise alarm clocks use halogen bulbs instead of LEDs. 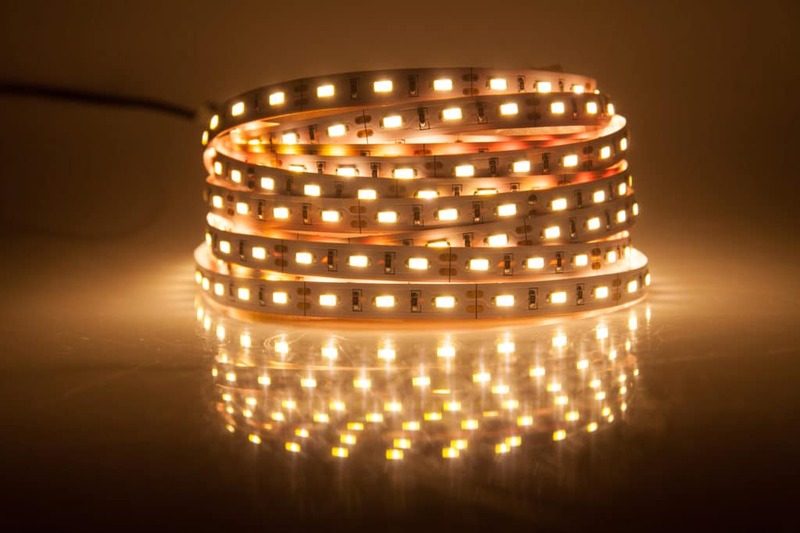 These are easier to replace, and some people simply prefer halogen lights over LED lights. One thing to be aware of is that halogen bulbs can get very hot with prolonged use. As you will be aware, a sunrise doesn’t consist of just one colour. Therefore, a further important consideration is the colour temperature of the light used by your sunrise alarm. More expensive models often have a number of different coloured lights, which are blended to create a very realistic sunrise effect. In these cases, the light will transform from a deep red/orange through to a bright yellow/white light when it is time for you to get up. On the other hand, basic sunrise alarms will often only feature one colour of light, such as white or yellow, which simply gets brighter as time passes. Both types will work in terms of waking you up, but those which have more than one colour are best. 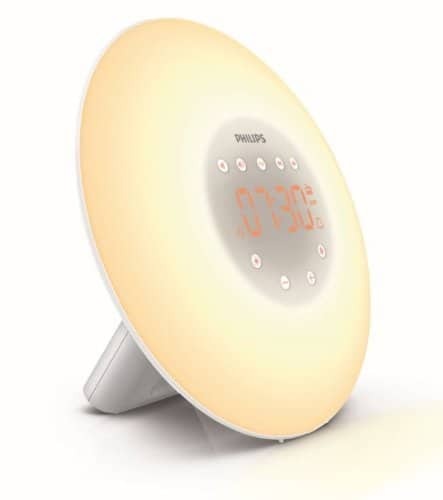 While it is true that all of the sunrise alarm clocks we have seen will brighten dark mornings and help you get out of bed, the best sunrise alarm clock for us has to be the Philips HF3520/01. We simply love how this has something for everyone. Offering both a sunrise and sunset mode, multiple alarm choices and 20 brightness settings, it certainly doesn’t skimp on features. Furthermore, the cool, contemporary design is sturdy and will look great in any room. The option to dim the digital clock is another great feature. Additionally, we were impressed by its ability to auto-adjust to ambient light too. Overall, if you are looking for the best wake-up light to help you survive winter, we think the Philips HF3520/01 is the one for you. I wish the country of origin was shown against each item for sale. Hi Malcom. Thank you for your feedback. We will keep that in mind.